Интересно проверить, не знаю как, что лучше 5 стаков Вливании тьмы, или эта чудо-тварь на несколько секунд. This talent wasn't mentioned in the patch notes. Did I miss something? It looks like it shoved master of ghouls up and Shadow of Death was removed. Assuming you hit it every time the CD is up, it gives a 12.5% increase to the ghoul's overall damage, which isn't terrible. Actually it is pretty terrible. Haste only affects white damage, not claw, which means its more like 6% or 7% overall ghoul damage, which means its less than 1% total damage increase for a talent point PLUS an unholy rune every thirty seconds. This might be a decent place to drop off a spare point if it was an RP based ability, but the rune cost likely means its spending a talent point to break even or possible reduce overall DPS. So far my favorite suggestion is to change this to 1 talent point to produce the same effect when you death coil your pet; replacing the rune cost with runic power and making it an interesting mechanic for a dk to min/max and keep running as well. Sadly this talent has been removed in PTR Patch 3.1.0 - Build 9658. This is ability primarily used for healing your pet. It is good. You have to remember that talents such as these are best used in certain situations. While the ability itself isn't so great from a DPS standpoint, from an overall damage standpoint it has its uses. Basically, any time that you can't hit a target but your little friend can, the benefits becomes substantial. PvE example: When you run out when a boss uses an AoE attack, dropping this on your Ghoul heals him and increases his damage until you get back (assuming you have Night of the Dead so it will live). PvP example: You are in / about to be put in a form of crowd control or snare, and are aware that you will be ensnared for a decent time. Using this helps prevent enemies from burning your Ghoul (with Huddle) and causes him to be more of a pain. Also it's just generally useful, since dumping your nice leftover Runic Power between fights to heal your Ghoul tends to seem almost wasteful. Maybe it will even generate Runic Power? Wouldn't that be nice. I can't imagine many PvE death knights taking this talent, especially if they put points into Night of the Dead. Using up an unholy rune will pretty much destroy an Unholy rotation, and the added ghoul DPS won't even come close to compensating for the damage loss - in fact, I even doubt that the ghoul remaining alive would compensate for the lost DPS. The only way I'd use this is if I had at least 8 seconds before a pull where I could regen that rune before I needed it again, giving me 20 seconds of free haste per combat. I can't ever see using this during combat for the reasons everyone else has already mentioned. Still not worth a talent point. I'd rather blow up dead stuff if I had a point to spare. this talent is in fact NOT useless. You'll want to keep Ghoul Frenzy up at all times, you can do this several ways - After an SS pop blood tap and Ghoul Frenzy in order to keep yourself with your rotations while increasing your pet's haste by 25%. When blood tap is down utilize the death runes in your rotation to cast ghoul frenzy and your strongest single rune nuke (I believe Plague Strike) this will make up for the DPS loss of a Scourge Strike. I've found that the best use for me with this is utilizing it for low level enemies, the kind seem to group up on you. it much rather continue on what im doing (mainly herbalism) and use one unholy rune instead of one of each kind for death and decay. Ghoul Frenzy generates 10RP per cast and be spammed out of combat making it handy for quickly building/maintaining high RP between pools or while waiting on a boss. Jury still seems to be out on wether or not this is a dps increase in a non sandbox setting given that you are losing a SS (plus the RP and potential disease refresh that comes with it) unless you time GF perfectly with a blood tap just after youve used up 2x death runes and no frost/unholy runes available (i.e. very situational). Although it may be hard to fit in to your routine, there are situations when it has a clear advantage. 1) as mentioned above... it's a spammable OOC ability for rp generation. 3) something to do when you can't engage the boss for a few seconds (i.e. sapphiron, emalon, sarth, anub...). The above make this talent worth spending 1 point for a heavy UH build. Being changed to have a 10 second cooldown in 3.1, no longer as useful for free RP generation. 50 Runic Power out of combat. With the low cooldown, this can be used along with Horn of Winter to keep your runic power up between fights. Extremely useful if you're expecting high damage at the beginning of a pull and you want to hit Icebound Fortitude, or just have the runic power handy for higher dps. Instead of thinking about min/maxing your dps, you really should think more strategically..
sure.. you've done the math on the dps of this buff, and deemed it to be useless, but think of the actual dps you gain if you use this skill for the runic power alone. Think outside the box people. In a PvP Situation, it could possibly proc when healing a ghoul OOC, and essentially guarantees that your Card will be on its internal cooldown if you fight someone else right away. While GF is useful to generate RP out of combat, that isn't worth a talent point when you could get something that helps you do more dps while in combat. With the 90% damage reduction on pets nowadays, this spell is even more useless. Does this also affect the pets summoned by Army of the Dead, the Skeletons from Book of the Dead, or Ancient/Antique/Antediluvian Cornerstone Grimoires? Cause I know that Night of the Dead talent affects those summoned from Army of the Dead spell but not sure if it also affects the skeletons from the Grimoires. No, those are all classified as guardians not pets. Beside the point i want to make; you should always keep your pet on passive. This ability costs 1 Unholy Rune, you'll be talent hungry, skip it. If you're doing a Solo/BG spec of some sort this might be usefull, just becouse it seems like a very good harass ability. Now, at first glance I seen this and thought "awful talent." But I made it my personal mission to find a use for it, a way to make it work, and I may have it. You would need glyph of disease, glyph of the ghoul. BS, BS, IT, PS, SS, SS (so your death runes come quick, and your desolation is up). GF, Pesti, SS, SS... You see what I'm doing here. If you ask me it should be changed to cost RP instead of an Unholy Rune. And besides, what nub got both Rune tap and Ghoul Frenzy :O? Purely out of curiosity, of course, but would this technically affect Gargoyle, as Unholy Presence does? This is pretty much a useless talent, aside from some PVP situations. You can deathcoil you ghoul to heal it if there are no aoe heals around, then again outside of PVP situations, your ghoul is disposable as the 30 sec wait on raise dead is hardly something that is missed. With Ravenous Dead and Glyph of Ghoul, your ghoul will be getting 152% of your strength (though they only get 1 AP per str) and should be doing around 12% of your overall damage. Mine does about 60% from melee and 40% from claw (I have Gnaw turned off to save energy, as you cant stun bosses). This would up the melee damage by 25% while having no impact on Claw. This would thus increase your ghoul's overall damage by 15%, assuming its up all the time, and thus, if your ghoul is doing a base 12% of your damage, increasing your overall damage by 1.8%, about as much as Unholy Blight which is passive. In order to even put this in a rotation, you need Reaping, however the best unholy spec is 0/17/54 and lacks reaping. As useless as this is in LK, it seems like it would be worth getting for Cata given current data, as haste will cause energy to regenerate faster and unholy DKs will have Reaping as a passive ability. Until then however, its best to stick to the 0/17/54 build. EDIT: now transforms your ghoul into a big monstrosity. Well you might not want to use pestilence on every "round" but you're raising a proper question anyway. Whats better dps, Frenzy or Blood Strike? I doubt this goes for reaping builds though. Anyone got a screenshot of what this turns your ghoul into in cata? Also, it says the ghoul's abilites are modified. This is making me want to bother playing my Deathknight again. The looks of this talent seems awesome . My little ghoul turned into a big bad lumbering beast ? Yes please ! Buffed up like a true big bad lumbering beast ? Yes please ! " Trigger " through Death Coil casts ( not clear if it works for dps or minion healing situations or ... ) or at least consume Shadow Infusion stacks ? Uhm ... I'll prefer to wait further updates and the Cataclysm official skill itself . But looks great for the fun ! Army Of The Dead , Gargoyle , Ghoul pet and now this ? My own personal army ! Hooraaaah ! Rune Tap does NOT generate RP, it use to before a certain patch but that was a LONG time ago, unless you thinking Blood Tap. Oh my god a deformed undead, a gargoyle and an entire legion of ghouls, and that deformed undead is obtained through Death Coil (with Руническая порча), sounds pretty good :D! Question, once active, can you still gain more charges of shadow infusion, or do you have to wait till the buff falls off to start collecting again? Big difference especially in raids, because if you CAN still get charges while pet is transformed, perma transform would be awesome for unholy dps. Sweeping claws! Whoop whoop even more insane Unholy AoE Damage. Yes Please! I described this talent to a friend and they said "so unholy gets their own pocket warrior?" I looked at the abilities again then said "yes. Yes they do." Actually, it says the it will consume all 5 charges, meaning that only Dark Transformation's 100% will stay on the ghoul after you transform him. I was personally hoping for a small version of rotface, as the icon suggests, but I guess we all have to compromise. Roxanne hops on Earthsmasher's back. Earthsmasher begins to cast poison nova! how to obtain 5 CHARGE? Summon Gargoyle now costs 1 Unholy and 1 Frost rune, so all is well. Is that sarcasm? Are you joking? Or are you saying this seriously? Don't even try to kill an Unholy DK's ghoul, because you will be ! @#$ED INSTANTLY! I really should have taken a screen-shot of that. 2.8k DPS may have been good at 72 back when WotLK was released, but anyone in BT/SWP gear can easily pull 3k+ at 70. When Dark Transformation is casted, the pet refresh all the CDs? And how many energy/focus have when the Dark Transfurmation is complete (100/100, 0/100 or the same amount which Ghoul had)? PS: I am not so good in English ._. Very good pve spell, however i see dk's speccing this for pvp. why? Its a huge pain to get the stacks in pvp unless u have the glyph that refunds rp to heal ur ghoul and quickly build up charges. That would spend death coil dmg, just for this move. I have a question for unholy dk's, does the ghoul even contribut 10% of ur dmg in pvp? I know its good for pve, gives improved aoe, but seems sorta useless for pvp. They spec into DT because of the interrupt, major damage and the good stun, and since unholy is about burst damage and some survivability along with it anyway, it is a fair addition, and to answer your question, during even WITHOUT dark transformation, the ghoul is about 30% of your damage. But, you might aggro too mobs in PvE like that. can be considered as the resources for Unholy Рыцарь смерти, each stacks of increase raised Ghoul's damage dealt by 10%; one can have 5 stacks of max. I was trying to find a list of all the minions and guardians available to players through spells, talents and glpyhs (not from items) and ended up creating one. Hope this is useful for others as well. Ghoul - Available at level 55. Geist - Minor glyph that changes the appearance of the Ghoul to that of a Geist. Skeleton - Minor glyph that changes the appearance of the Ghoul to that of a Skeleton. Undead Monstrosity - Available at level 70. Transforms the Ghoul into an Undead Monstrosity. Gargoyle - Available at level 74. Legion of Ghouls - Available at level 80. Various undead - Minor glyph that changes the appearances of the Ghouls of the Army of the Dead into various undead minions. Treants - Available at level 60. Four different versions: Balance, Feral, Gaurdian and Restoration. Water Elemental - Available at level 10. Unbound Elemental - Minor glyph that changes the appearance of the Water Elemental to that of an Unbound Elemental. Xuen, the White Tiger - Available at level 90. Guardian of Ancient Kings - Available at level 75. Three different versions: Holy, Protection and Retribution. Shadowfiend - Available at level 42. Mindbender - Available at level 45. Sha Beast - Minor glyph that changes the appearance of the Mindbender to that of a Sha Beast. Earth Elemental - Available at level 58. Fire Elemental - Available at level 66. Spirit Wolves - Available at level 60. Spirit Raptors - Minor glyph that changes the appearances of the Spirit Wolves to that of Spirit Raptors. Imp - Available at level 1. 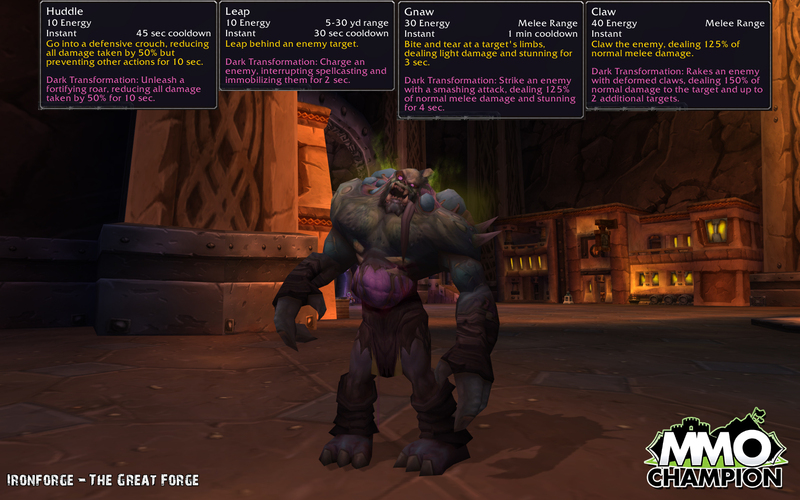 Fel Imp - Available at level 75 upon learning . Changes the appearance of the Imp to that of a Fel Imp. Voidwalker - Available at level 8. Voidlord - Available at level 75 upon learning . Changes the appearance of the Voidwalker to that of a Voidlord. Succubus - Available at level 20. Shivarra - Available at level 75 upon learning . Changes the appearance of the Succubus to that of a Shivarra. Felhunter - Available at level 29. Observer - Available at level 75 upon learning . Changes the appearance of the Felhunter to that of an Observer. Felguard - Available at level 42. Wrathguard - Available at level 75 upon learning . Changes the appearance of the Felguard to that of a Wrathguard. Infernal - Available at level 49. Abyssal - Available at level 75 upon learning . Changes the appearance of the Infernal to that of an Abyssal. Doomguard - Available at level 58. Terrorguard - Available at level 75 upon learning . Changes the appearance of the Doomguard to that of a Terrorguard. Eye of Kilrogg - Available at level 22. Using Dark Transformation while you have an Abomination turns your Abomination into a Flesh Beast like Rotface or Festergut. Works with control undead minions. It will also retain weapons if possible. Превращает вашего вурдалака в могучего монстра-нежить на 15 sec. Пока действует превращение, способности вурдалака усиливаются и обретают дополнительные возможности. Наносимый урон увеличен на 200%.